My book V is for Vegan came out in April this year. Just as it went to print in late 2014, I started to hear about a new vegan technique referred to as aquafaba, a term coined by American software engineer Goose Wohlt. It entails using bean water as an egg white replacement – you can, for instance, make a vegan meringue from leftover chickpea water. It sounds incredible, mind-bogglingly weird. But it is this sort of innovative approach that originally attracted me to writing about veganism: restriction promotes creativity. So it’s taken me all year to actually have a go at this myself. 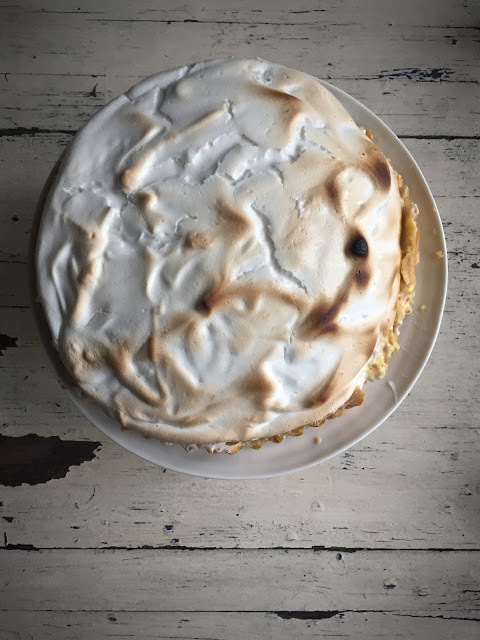 This week I used a can of chickpeas, drained it, used the garbanzos to make hummus and whipped the remainder (around 170ml to 200ml of liquid) with 200g of caster sugar to make meringue. And it worked. I just dumped both into my stand mixer with a whisk attachment and watched. After five minutes I had a bowl full of firm fluffy white meringue. I tasted it: no bean taste at all. I tried a dollop on a silpat in the oven which twenty minutes later turned into a perfect crispy little meringue. My first Aquafaba recipe is for Lemon Meringue Pie, which is a favourite of mine. This vegan version is very light, almost mousse-like. My non-vegan parents actually preferred the vegan version to the normal pie. This is a first draught of the recipe and I’m going to work on it a bit more because as you can see in the top photo, the crust collapsed a little bit but it does taste delicious, really moreish. You can keep your aquafaba meringue for a few days in the fridge. If it starts to separate, just whip it up again. 30ml aquafabs is 1 medium egg white to 40ml of aquafaba is equivalent to 1 large egg white. 45ml aquafaba is one egg. Aquafaba replaces egg whites but The Vegg (as recommended in my book) is still best for yolks. You can use any bean water for this, I’ve also heard you can use tofu water/whey (my next experiment) for similar results. Certain brands of beans/chickpeas work better than others. I used a Tesco’s own brand tin. If using raw beans/chickpeas, you don’t want the water from the soaking but the water from the cooking. Remember, beans in tins are already cooked. You can also make meringue from flax seed eggs (20g ground flax seed soaked in water) but you can’t cook it. You can cook aquafaba. You can make meringue, macarons, mozzarella, yorkshire pudding, chocolate ganache, swiss rolls, in breads, cakes, cookies, royal icing, butter cream icing, whipped cream (add cream of tartar), egg wash, all sorts of stuff. If you want the classic non-vegan version of Lemon Meringue Pie, follow this link to my piece on the House and Garden site. There are several vegan curd recipes, I used one with silken tofu adapted from this site.You don’t have to use the yellow food colouring, but otherwise this recipe is rather pale (remember egg yolks add to the colour in the non-vegan recipe). Freeze the olive oil in a plastic container. Then, using a stand mixer with a beater attachment, or a large bowl and two knives, work the oil into the flour, icing sugar and salt, then gradually add the water until you have a pliable but not sticky dough. Mix or press together until you have a ball. Flatten it into a disk, cover with clingfilm and leave in the fridge for 30 minutes to rest. Preheat the oven to 180ºC. Butter the pastry tin, bottom and sides. Remove the pastry from the fridge and unwrap it. Using quarter turns, roll out a circle 2cm thick and approximately 28cm diameter, on a clean countertop. Lifting the circle with your rolling pin, drape it over the pastry tin, pressing it into the sides carefully so as not to tear it. Put a layer of tin foil into the pie tin and then fill it with baking beans for you are going to bake it blind. Place in the oven on a middle shelf for around 15 minutes then remove the foil and beans ( I just lift up the foil on both sides with the beans inside). Bake for another ten minutes. Put the lemon juice and agar agar into a medium pan on to a low heat and stir continuously until the agar has melted (taking care not to let the mixture boil). Add the lemon/agar mixture to the blender and process, starting low and going to full speed, for a few minutes. Then add enough yellow food colouring until you have the shade you want. Remove the pie base from the oven and let the pie cool. Pour the curd into the tart, spreading it evenly. Any excess curd can be put into a glass jar and kept in the fridge. You can use it on toast or whatever, but it’s actually really good as a vegan lemon syllabub. Put it in the fridge and let it cool. Add the chickpea juice the sugar, the vanilla in the bowl of an electric mixer. Beat on maximum speed for up to ten minutes or when the mixture is stiff. 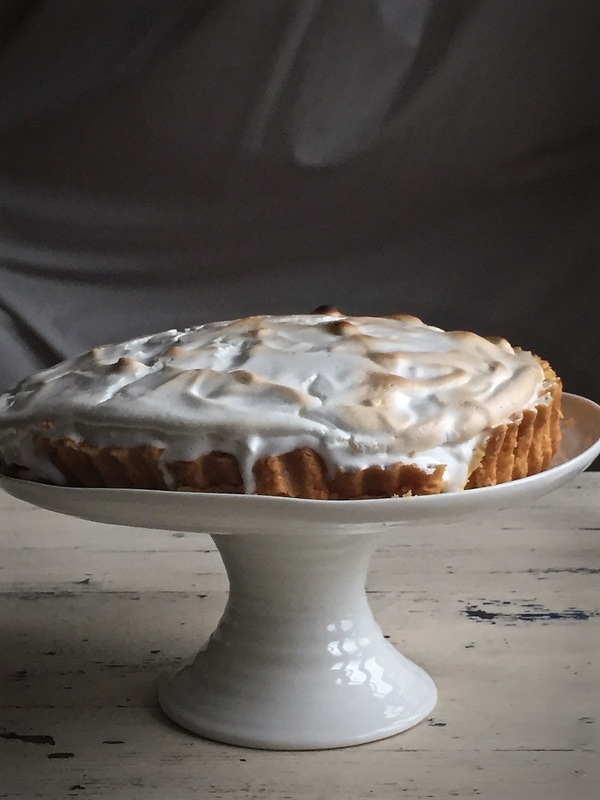 Using a rubber spatula, spread the meringue thickly over the lemon curd pie, making sure you have nice peaks. Bake for another five to ten minutes or until the peaks are slightly golden. But if you have a blow torch, use that instead of rebaking it. So no sugar in the meringue ? I ask because I just tried making aquafaba meringue and got stiff peaks which collapsed when I added sugar. 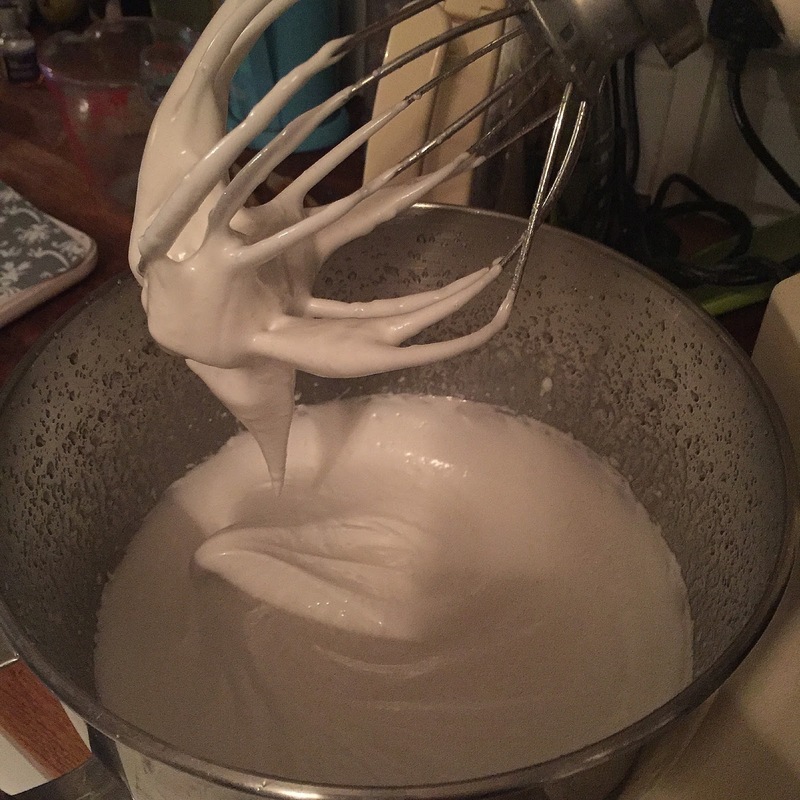 "whipped the remainder (around 170ml to 200ml of liquid) with 200g of caster sugar to make meringue." Yes there should be sugar. I put approximately 1:1 ratio. It shouldn't collapse. It has never collapsed with me. Make sure your bowl is clean and free of any grease?